Dad = POTUS-41 All the Best 1924-2018 George H.W. Bush . Dad served as VPOTUS under POTUS-40 Ronald Reagan and a single, unpopular term as POTUS-24. However for most of his career dad was a manager (3) of various government bureaucracies Surya-Makara-Draco including the Central Intelligence Agency and dad was notably involved in the multi-lingual, multicultural adventures Surya-yuti-Rahu of USA intervention in Cuba with his long-term peer-adversary Cuba-Dictator 1926-2016 Fidel Castro . 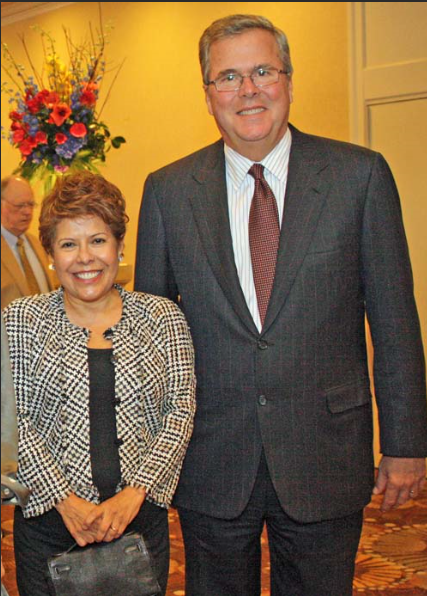 Jeb Bush continued the Bush family business (3) in Gulf of Mexico and Caribbean ptroleum extraction. Surya-yuti-Rahu-petroleum , smoke, oil Makara rock. 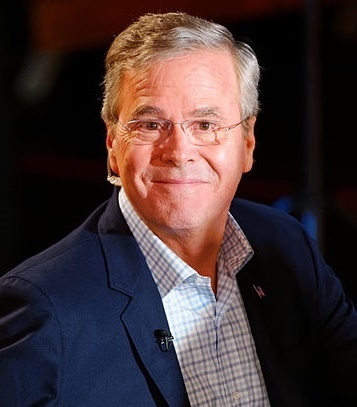 a Latin-American Studies college major and businessman in the markets serving los Hispanohablantes, Jeb Bush has been an advocate for outsider Hispanic communities for decades during the contentious anti-immigration debates. Dharmesha Chandra-2 global languages. A big asset for Mr. Bush's political appeal to the Hispanic electorate is his fluent spoken Spanish language. Mom = POTUS-pair-41; POTUS-43 mother 1925-2018 Barbara Bush Her focus was family (2) curating and collecting assets, maintaining the lineage (2). 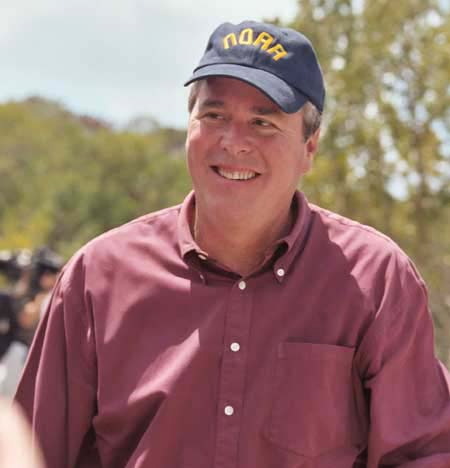 Jeb Bush's immediate elder sibling Robin Bush left her fleshbody via leukemia when little Jeb was 10 months old. She is represented by his Shani-12 in 11th from-Chandra = immediate elder sibling. Jeb Bush's elder brother POTUS-43 Decision Points 1946- George W. Bush is seven years his elder. POTUS-43 is represented by 11th-from-the emotionally motivated community-linking, economically gainful, profit-regulated, friendly, participatory, goal-oriented, socially-networked 11th-from-Chandra = bhava-10 Simha leadership roles. Jolly Jupiter affecting 10-12-2 = expansive recipe for Mr. Bush's reputation as a "nice guy" in leadership roles (10) which are facilitated by his dealings in foreign worlds (12) and the power of his family (2). Guru-6 suggests health conditions and disagreements internal to the family. uttama-Zukra rules 7 ( alliances, marriage, bargains) ++ 12-foreign lands. kalatra-karaka Zukra Mrs. Bush hails from Mejico. Rahu in bhava-3 * the Shadowy Specter seeks privilege via glamorous or unusual writing, reporting, news announcements, cinema, commentary, messaging, publishing; desires a special, important explanatory, descriptive, or instructional role in commercial business, internet, cinema, or communications media. Exciting, opportunistic, ambitious sibling-cousin, cohort, or touring ensemble. Rahu-Mithunaya in 10th navamsha also points highest leadership capability based in the mundane skills of management, meetings, and messaging..Like his dad, Jeb has significant bureaucratic skills. He can message in Rahu-shapeshifter ways to sound socially progressive like big-picture thinker during a climate of single-issue politics. He can also message like a pro-business commercialist. He can adopt the mask of virtually any platform, agenda, or message due to the iconic strength of Rahu-Mithunaya in 10th-navamsha.